Does your Florida company need to sell office furniture because of an upcoming move, change in ownership, or office closure – or simply because you’re ready to upgrade to all new furnishings? Ajax Business Interiors has purchased office furniture from businesses throughout the Tampa Bay area and Florida, which helped them get rid of unwanted office furniture quickly. We are always interested in purchasing quantities of quality office furniture such as cubicles, telemarketing stations, executive office furniture, conference tables, chairs, storage cabinets, filing cabinets, vertical files, and lateral files. Quantity – how many items you’re selling. Condition – whether the office furniture is in like-new condition or has damage. We require cubicles for sale to be built, not broken down, so we can ensure all parts are available. Appraisal – we may want to see your furniture in person before we buy it. Location – whether you are trying to sell office furniture close to us in Clearwater or you are farther away in Orlando, Sarasota, or Fort Myers. Cost of removal and storage – our investment in picking up your office furniture, delivering it to our warehouse, and storing it until we’re able to resell it. 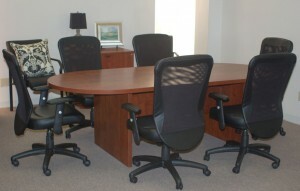 Resale possibilities – how easy or difficult it will be to resell your office furniture. Inventory – A list of the office furniture you’re trying to sell. Location of furniture – Let us know the city and state where the furniture is located. Requested removal date – Let us know if you have a specific deadline for removing your items. Digital photos – Send digital photos showing several views of the furniture, including close-ups, wider shots, and photos of any imperfections. Contact information – Your first and last name, company name, phone number, e-mail, and the best method and time to reach you. Ajax Business Interiors has 25+ years of experience buying, selling, and appraising office furniture. For more information, please contact us today. We are an office furniture liquidator buying from businesses in Tampa, St. Petersburg, Bradenton, Sarasota, Brandon, Cape Coral, Orlando, and throughout Florida.